The American Library Association gave The Sugarless Plum a star— which indicates a work is outstanding in its genre— in the November 1, 2009 issue of Booklist Magazine. “After learning to dance in Thailand during her dad’s army tour, Karz studied at George Balanchine’s School of the American Ballet, the training ground for the New York City Ballet. At 17, she danced as the Sugar Plum Fairy in The Nutcracker, and at 20 she danced in company cofounder Jerome Robbins’ Goldberg Variations. Loving the “order and control” of dance, Karz was shaken to the core when she was diagnosed with diabetes at age 21. Failed attempts at self-healing were followed by insulin injections and blood tests throughout her demanding routine of classes, rehearsal, and evening performances—all in secret to conceal the severity of her illness. Six years later, after she’d toured internationally despite frightening fluctuations in blood sugar levels, she remained in the corps de ballet, then was promoted to soloist. “In 1987, when Karz was 21 and dancing in the corps of the prestigious New York City Ballet, she began to suffer constant thirst and dizziness, frequent urination and oozing sores under her arms. After an initial misdiagnosis and months of denying the seriousness of her condition, Karz faced the devastating reality that, as a type 1 diabetic, she would have to take insulin injections for the rest of her life, check her blood-sugar levels at least 10 times a day and was at a high risk for infection and even amputation. Karz details the ups and downs of her childhood, illness and 16-year NYCB career, from a low-blood-sugar episode that almost derailed a performance in Copenhagen to dancing with George Balanchine himself at a School of American Ballet rehearsal; being cast as the Nutcracker’s Sugar Plum Fairy; and her promotion to soloist six years after her diagnosis. From the very first sentence I was pulled into a magnificent story of triumph over adversity. Zippora’s story gives courage and strength to anyone with diabetes. A must read for anyone with diabetes or knows someone who does. Zippora followed her passion and found a balance necessary for a full and rich life. Zippora has enabled us to realize that with support and commitment dreams can come true and diabetes can be conquered. Her story is an inspiration for us all. With generosity and courage, Zippora vividly describes her passion to dance while balancing her ever-changing need for medication. She was an exquisite dancer and this is a beautifully written and inspiring book. Zippora masterfully integrates her experience at the highest echelon of ballet with a life-threatening disease to provide an inspiration for all who struggle with diabetes. Zippora was an enormously talented dancer and she brings to this book her unique perspective on being an athlete with diabetes. Her wonderfully positive outlook provides invaluable information that readers will find both helpful and fascinating. Zippora Karz had what the great dancers have: a pure-hearted musicality that could bring audiences to tears. You won’t be able to put this book down. “The diabetes community’s favorite prima ballerina, Zippora Karz, has added “children’s author” to her resume. She’s just published a thoroughly charming book about a school-age girl with a passion for ballet who gets diagnosed with type 1 diabetes right before the biggest performance of her little life. Plus there’s a nice two-page section at the back of book called “Diabetes Explained” written by none other than the legendary endo Dr. Fran Kaufman of the USC School of Medicine and Medtronic Diabetes. The book is mildly biographical, with the main character being a young girl named Zippy — although the real Zippora was actually diagnosed at age 21, when she was already an aspiring ballerina with the New York City Ballet. In the book, Zippy is so excited to be chosen to dance as leading ballerina in her first performance! But soon she’s feeling weak, peeing a lot, and even collapses during rehearsal. Her parents take her to a (surprisingly relaxed and upbeat) doctor, who confirms that she can continue dancing, as long as she learns to do her shots, test glucose regularly, and “keep some sugar off-stage, just in case your blood sugar drops too low.” She’s fiercely determined not to give up her dancing, especially after a fairy-godmother-ballerina appears in her dreams. But when Zippy returns to dance class after being out several weeks adjusting to her diagnosis, she finds she’s been replaced in the lead role — oh no! But then… well, I won’t give it all away. 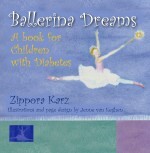 More information on Zippora Karz and Ballerina Dreams available at Diabetes Mine.